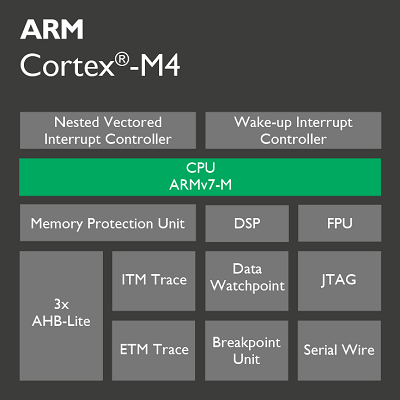 The Arm® Cortex®-M4 processor is a high performance embedded processor with DSP instructions developed to address digital signal control markets that demand an efficient, easy-to-use blend of control and signal processing capabilities. The processor is highly configurable enabling a wide range of implementations from those requiring floating point operations, memory protection and powerful trace technology to cost sensitive devices requiring minimal area. Achieve exceptional 32-bit performance with low dynamic power, delivering leading system energy efficiency due to integrated software controlled sleep modes, extensive clock gating and optional state retention. The Cortex-M4 has been specifically developed for partners to design high-performance low-cost devices for a broad range of digital signal control embedded market segments.